Corner hutches from Brandenberry come in a wide variety of styles and sizes. So they’re the perfect way to maximize space while adding elegance to your dining room. Plus, Amish artisans custom-craft each unit, using solid hardwood. This is your assurance of furniture with superior looks and quality, plus long life. A trim profile highlights the 25 Inch Corner Hutch. Sleek and simple construction accents the 34 Inch Corner Hutch. A true classic, the Brookline Corner Hutch boasts a timeless design. The Corner Hutch possesses a stately elegance. 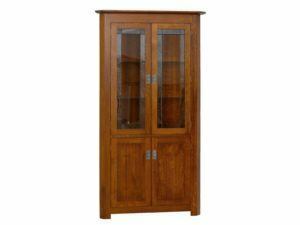 Beautifully-crafted and sleekly-finished, the Lainey Brown Maple Corner Hutch is fine home furnishing. Also check out the classic Lainey Corner Hutch in Oak wood! 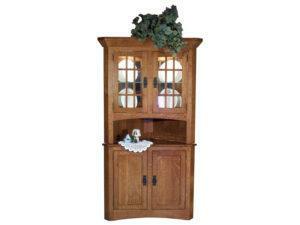 The Lainey Corner Hutch is handcrafted by fine Amish craftsmen and features traditional or mission styles. Be sure to view the wonderfully-crafted Lainey Brown Maple Corner Hutch. Stunning wood construction accents the Mill Valley Corner Hutch. 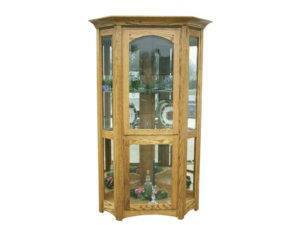 The Sante Fe Corner Hutch features mission styling and fine Amish craftsmenship. Adjustable shelving create dynamic storage space in the Shaker Corner Cabinet. The West Lake Corner Hutch blends classic design with timeless style. The impressive collection of corner hutches from Brandenberry Amish Furniture represents the perfect blend of strength, style and space. And skilled Amish craftsmen beautifully handcraft and lovingly finish every unit. Also, they use solid hardwoods like oak, maple, cherry and hickory. So the corner hutch you choose will be very sturdy. In fact, the unit, with proper care, should last for generations to come. Even becoming a family heirloom. Wish to modify the corner hutch you like best? No problem. Just tell us your preferences. Like wood specie and stain. Plus hardware, lighting and type of glass. And we will build you a unit that gives you the corner on enjoying your dining room. To see our corner hutches firsthand, visit our store in Shipshewana, Indiana. You’ll be inspired by our selection of beautiful furniture — and by the beautiful Amish countryside.